Things to add and remove and change and repair on the new van | Camperissimo! Hey guys, where are you? What’s up, what’s down, what’s on the agenda? need some help? need some more input? Ive had some experience with the list of DIY jobs you have up there, if I can help, just let me know. We haven’t even picked up the new van yet, but already I’m already making lists. 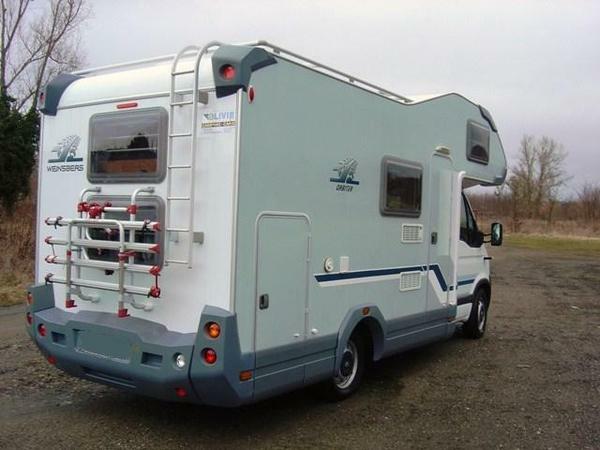 As per our agreement with the dealer, he’ll organise a new TÜV and gas certificate, re-mount a 4-bike rack and the standard aluminium ladder on the rear of the van. He’s also going to replace a broken cupboard handle and the fixing clip to pin the garage door to the side of the van when open. Although a backup camera is fitted, the previous owner removed the monitor from the cabin, leaving the whole radio area empty. Since the camera is already mounted, I’ll attempt to find and fit a compatible replacement backup monitor. The van has a SAT-TV receiver with a 12V LCD-screen which folds away and a mechanical satellite dish on the roof. Since I can’t imagine using it, I’ll find out if might be worthwhile removing the SAT-TV setup and selling it (probably not). The 12V probably doesn’t have an HDMI socket, in which case it might be interesting to adjust the folding screen mount to hold a tablet PC instead. A second board battery and a 230v inverter so we can use normal appliances on the road without killing the battery in 10 minutes. Removing the SAT-TV and 12v LCD TV in the hope of selling them for a reasonable price doesn’t seem that realistic, plus there’s the added disadvantage of removing the dish from the roof, which would leave holes to be filled to ensure the integrity of the roof. The on-board battery is actually only 65Ah (not 80Ah). I’ll definitely be replacing this with two 100Ah batteries, mounted in parallel. The battery is fitted underneath the driver’s seat, and there’s definitely enough space to mount the second battery in the same space. A solar panel setup is definitely a must, rather than a maybe, since it will guarantee us a full battery at the beginning of any journey after a few days of charging while parked and not in use. I’m leaning towards investing more in a higher power panel, since this seems fairly vital for our style of travelling. There are well-rated (at least on Amazon) 12v to 230v inverters available on Amazon starting from only €40. The maximum power rating is fairly low (150w/300w), but for us this might well suffice. One model from AEG features a remote control on/off switch. Whichever model we opt for, a remote switch will be necessary because the inverter draws current constantly, even when not in use. Some research on double-DIN car radios was really helpful, there are several models for around €300, which work together with any standard reversing camera and also feature bluetooth and support Mirrorlink, which would allow us to use Android-based GPS software via the car radio screen. Today we’re picking up the van, and I’ve promised Iva that I won’t start buying anything until we’ve been on at least one trip to get a feeling for the new van. This entry was posted in Camperissimo II in 2015, Repairs & Modifications, Weinsberg Orbiter 591 G and tagged 2015, Modifications, planning, Weinsberg. Bookmark the permalink.